What do Ernest Hemingway, Francisco de Goya, Nancy Reagan, the King of Spain, Jack Nicholson, a Belgian diplomat, a Japanese engineer and a dentist from Ohio have in common? Will give you a hint: Madrid. And another: the oldest restaurant in the world. 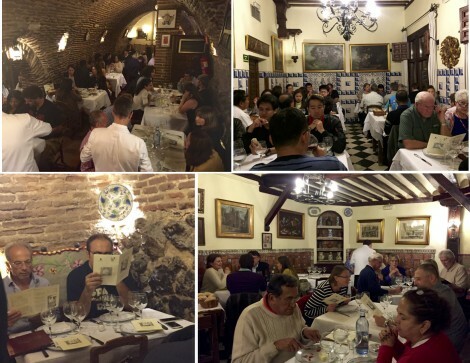 Along with countless writers, artists, heads of state, celebrities and tourists, the above have dined at Restaurante Sobrino de Botín, Madrid’s most famous restaurant. A French cook, Jean Botín, first opened Casa Botín in 1725. When the cook and his wife died, a nephew took over accounting for the name change to Sobrino de Botín (Nephew of Botín). The restaurant sold to the González family in the 20th century. 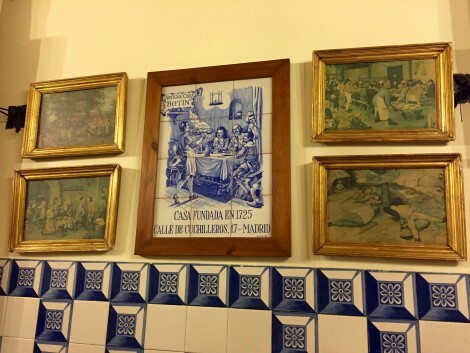 Despite surviving13 monarchs, two World Wars, and a slew of nasty coups and uprisings, the two families kept Restaurante Sobrino de Botín thriving through the centuries. 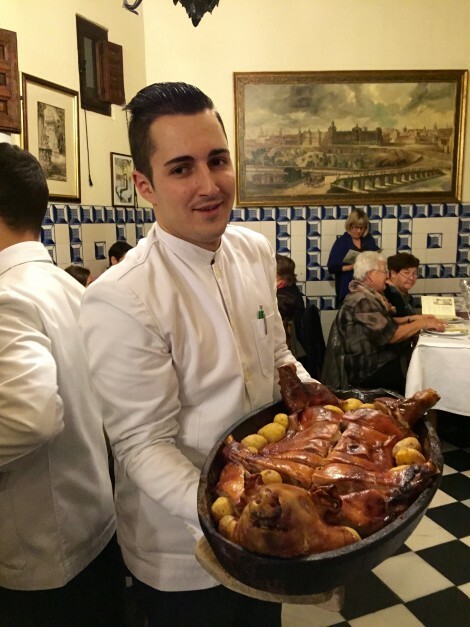 The Guinness Book of World Records lists Sobrino de Botín as the oldest continuously operating restaurant in the world. Botín still occupies its original space on Calle Cuchilleros (aptly translated cutlery street) in the heart of medieval Madrid, a few steps from Plaza Mayor. 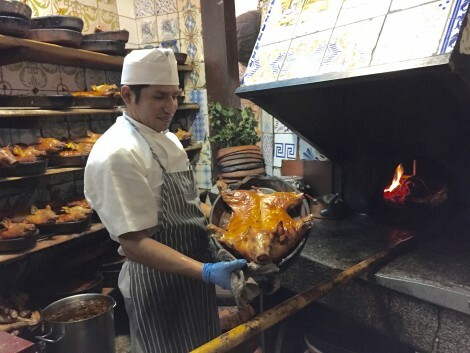 And the restaurant still cooks in its original wood burning stove and still serves traditional Castilian food to throngs of admiring diners. but the dining experience is not just about participating in history. The must-order dish remains cochinillo asado (roast suckling pig) with a runner up of of cordero asado (roast lamb). 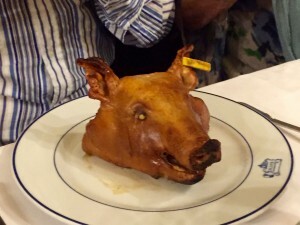 Botín gets their pigs from Segovia and roasts them in the restaurant’s original oven until the skin turns crispy crunchy golden brown locking in the meats rich succulent tenderness. 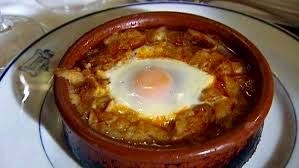 Old-style Castilian specialties supplement the roasted meats, with sopa de ajo castellana con huevo (garlic soup with egg) a most popular starter. Cover the bottom of a medium skillet with olive oil and put over high heat. When the oil is hot, add garlic. Fry about 30 seconds then add ham. Fry another 30 seconds and add bread. Sauté, tossing with a spatula until bread absorbs the oil and light golden brown. Sprinkle with paprika and salt. Toss well. Add the hot water and bring to a boil. Reduce heat and boil 5 minutes to release and blend flavors. Divide the soup among four heat proof bowls. Break an egg on top of soup in each bowl. Place bowls in the preheated 375°F oven and bake until egg is set, about 5 minutes. 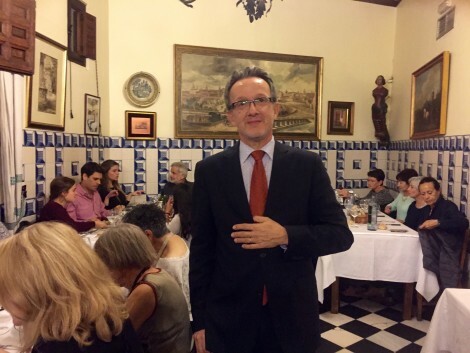 For more information about Botín click HERE.